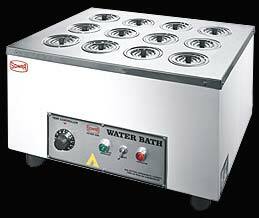 As an eminent Manufacturer & Supplier, we offer Rectangular Water Bath in a wide gamut of sizes. Due to its Single panel feather touch LED and automatic priming, it is widely praised and treasured. It is ensured there is no drop in quality as it is in conformity to industrial quality standards by our skilled quality auditors. Besides, it is available for affordable prices. It is widely used across different industries for various applications. Semi Automatic – Digital Model For Dry Sterilization. Radial Locking system - Mode of steel bars. ambient to 95oC. Fitted with pilot lamps & On/Off switch. S. No. Cat No. Size of Inside S. S. Chamber (H x W x D) Ltr. NPL or NABL accredited Lab.